Every year in spring, vacationers make a beeline for Kinh Bac (the Red River Delta region) to take part in village festivals that come soon after Tết. Here, youths sing Quan Ho, a northern music style, play folk games, participate in cooking competitions, and make cakes. As people leave after the festivals they buy phu thê (husband and wife) cakes for relatives and friends as spring gifts. Dinh Bang village in the northern province of Bac Ninh is a place where people make the most delicious phu the cake in the country. The cake used to be an indispensable item while offering gifts to kings in the past. It was first made by Queen Y Lan, the wife of King Ly Thanh Tong, to show her love for him after he was away for long fighting enemies on the southern border. In 1069 King Ly Thanh Tong and one of his highest-ranking officials, Ly Thuong Kiet, led a battle against enemies after appointing Y Lan as a queen regent. 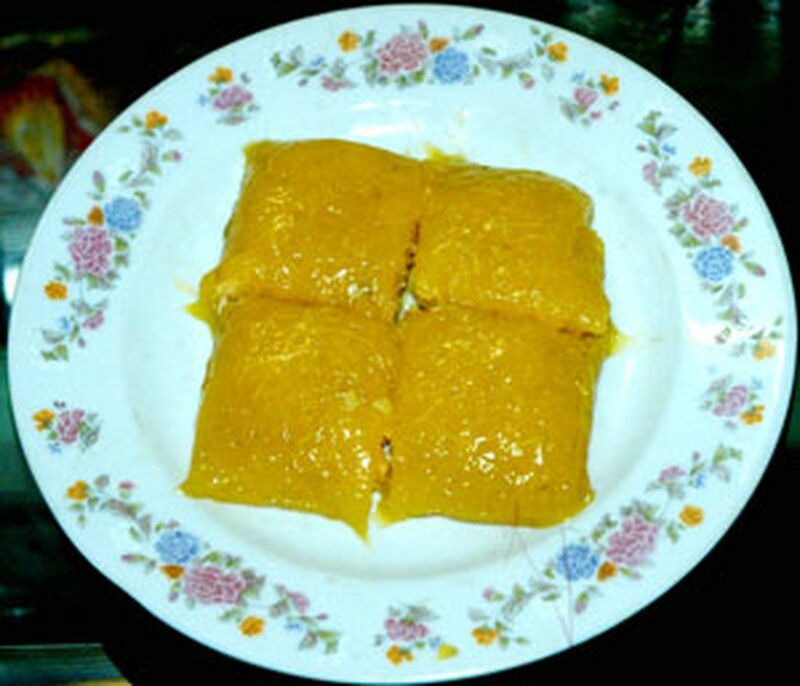 Because the king could not return for Tet, Lan made the cake using carefully selected glutinous rice, beans, and lotus seeds, and sent it to the front for the king and his soldiers. To make sure she made the perfect cake, Lan fine-tuned the recipe over and over again. The result? The cake was not only exceedingly delicious and healthy and lasted a fortnight without spoiling, but also a symbol of her love for her husband. Hence the name phu the (husband and wife) and always tied in pairs with rose strings. It is often confused with su se (or xu xe) cakes used in weddings. But phu the is very different in appearance and ingredients used. Su se is made from rice or cassava flour depending on which one is available locally, and covered with glazed paper or nylon. Phu the is made from a special kind of flour, always packed in pairs, and covered with phrynium leaves. Making the cake is an art. Its ingredients must be chosen carefully. Large-grained glutinous rice is cleaned and soaked in water for three hours and then ground into flour. The flour is filtered several times until extremely smooth. It is kneaded with gardenia flower attar until it turns amber. Green papaya is sliced into small threads, soaked in alum water, and kneaded together with the flour. The cake’s filling consists of green bean paste mixed in sugar syrup with copra threads and lotus seeds. After the flour and the filling are ready, chefs begin to wrap the cakes. Phrynium or banana leaves are placed in a square-shaped frame and the flour and filling are rolled into a ball in the center. Then the cakes are covered with one more layer of leaves and tied in a square shape. Skilled chefs can wrap the cakes without having to use the frame. The cake is then steamed for an hour (not boiled, as is the common misperception). After getting the cakes out, the chefs use a flat plank to press them slightly to make them even and tight before tying them in pairs. The best way to enjoy a phu the cake is by placing a peeled one on a ceramic plate. The smell of glutinous rice, green bean, coconut, and lotus seed is delicious and bewitching. The perfect cake must be sweet with the flour becoming leathery and brittle. It can be eaten for breakfast or dessert. These days, there are many bakers in Ha Noi and, generally, the Kinh Bac region making phu the cakes, but the most delicious are made in Dinh Bang. If you are passing through the village, you can’t go much wrong stopping by to get some of these cakes as a gift for family and friends.